We've teamed up with Tyler Mallari (@themuslimmale) to put together some Men's fashion inspiration for the upcoming Eid al-Fitr. With brothers and sisters both taking advantage of these blessed last ten nights of Ramadan and plans being made to celebrate the upcoming holiday with friends and family, the fashion-conscious among us brothers are already getting pumped for showcasing our Eid outfits. Whether our styles are inspired by the traditional, streetwear, minimalist and other styles or a complete mixing or divergence from them, a lot of us still crave fresh inspiration for flexing our creativity. However, with Eid being smack dab in the middle of summer this year, a lot of our favorite options, such as jubbahs, turbans, djellabas and even chunky footwear, are out the question and one is left to wonder how best to combine the lightweight pieces we have so that we still pull off a creative outfit. Thankfully, Bahath and I, Tyler (Salman) Mallari of The Muslim Male (@themuslimmale on Instagram) have teamed up to bring you a list of Eid essentials and a few outfits for inspiration for this year’s summer Eid. For the brothers who prefer a tailored, minimalist look, the lightweight thobe is a must. Though short-sleeve thobes are also commonplace, they are typically reserved for casual settings within the Arab world and wouldn’t fare well when you’re attempting to stunt on the jamaat during Eid. Again, choose light colors which will reflect, not absorb, the heat and avoid heavier materials such as polyester and wool. Additionally, go for thobes with a more streamlined fit like these from Al Faizan to avoid looking like you’re swimming in fabric. Perfect for lovers of drape who want to add a touch of Desi to their outfit, the cotton kurta is a classic whose variety of patterns and styles can very well reflect the personality of the wearer. Choose plain kurtas for a minimalist appeal, embroidered kurtas for a more royal look and loud patterned kurtas for a youthful edge. While these are typically paired with traditional shalwar or churidar, I also enjoy pairing them with three-quarter, cotton drop-crotch shorts for an interesting high-low appeal that’s perfect for summer temperatures. For a western touch, select a tailored polo for a look that’s both clean and office-friendly. Again, feel free to go as subtle or bold as you wish and pair with either khaki, grey or colored chinos for an interesting palette and low-vamp loafers for an easy, unfussed look. Another idea would be to pair a polo with an embroidered Yemeni style izar for a bold East-West ensemble. Perhaps the most exciting newcomer to streetwear, the lightweight, short-sleeved kimono is an excellent option for brothers who want the draped effect of a jubbah without the weight and long sleeves. Pair with lightweight chinos for a contrast effect between draping and tailoring or go full drape with either a pair of cotton shalwar, baggy three-quarter or drop crotch shorts. Though longline tees are indeed the most casual of the tops listed here, I still chose to include them because they are the most summer-friendly and give the effect of a draped kurta while maintaining a modern air. Though they’re typically paired with streetwear staples like baggy jeans and chinos or even athletic shorts, these can also easily be dressed up with a tailored pair of chinos, loafers and a nice watch or can be paired with baggy cotton shorts for an easy, draped ensemble. Though shalwar (also known as sirwal and sarouel amongst the Arab community) are typically worn under the Pakistani kameez, they can also be worn separately as statement draping pieces, as seen above. Pair with a tailored tee, watch and low-key sneakers for a minimalist streetwear look that showcases the shalwar or with a longline tee and statement footwear for a more bold look. Tailored chinos add a touch of professionalism to any outfit they’re added to and are the go-to option for brothers who have to dash back to work after Eid prayers. Go for khaki or slate grey for a classic appeal or have fun with pastel hues of pink, yellow, blue and more for a touch of personality. Well-loved by our brothers in the U.K, the three-quarter short allows breathability whilst maintaining the covering of the awrah. In order to avoid looking like a wannabe footballer, stick to classic colors for a modern appeal that’s part nomad and part street cred. While the lungi/sarong/izar is typically used within Desi and South-east Asian contexts for casual wear exclusively, the embroidered Yemeni izar (called “maawaz” in Yemen) is used in Yemen for smart casual and even formal attire as well. These intricate statement pieces can be worn by themselves under a longline tee, casual polo or kurta or under a thobe as a lightweight underwear option. Find them online on sites such as Reflections of Iman and Zarinas. A tried and true classic, cotton kufis add a nice minimalist touch to any outfit and add traditional flavor without being overbearing. Go for light colors like white or tan in a more open, loose wave to stave off the heat or rock a bold hue of blue, red or green for a nice pop of color. A virtual unknown in the Muslim fashion scene, the straw fedora hat, or “Panama Hat” adds a touch of class to Western-inspired outfits and makes for a unique ensemble when paired with traditional Eastern pieces such as kurtas and thobes. Though wide-brim fedoras such as these are typically more suited to those with longer face shapes, short-brim versions (known as “porkpies” or “trillbies) are available for those with shorter faces and of course, any hat in any shape can be carried off well when worn with confidence. It should be noted that because this is more of a statement piece, it’s best to keep the rest of your outfit simple, with very few if any patterns or contrasting lines. A favourite in the streetwear scene, ballcaps add youth and edge to any outfit they’re paired with. Because of the wide variety of styles they’re available in, it’s completely up to you how loud or minimalist you want yours to be and these caps can be a perfect way to show allegiance to your favorite brands or sports teams. I personally prefer mine with little to no design or details in order to draw attention to the lines in my outfits and additionally because with my light olive skin tone, bright colors wash me out more than anything. The obvious summer option, sandals are perfect for sliding in and out of the mosque. I personally prefer to wear either streetwear classics like Nike Slides for a low-key casual or minimalist looks or high-quality leather gladiator sandals like the Adidas Y-3 Qasa Sandals or ASOS variety shown above. Style as you please, though avoid chunky types that will stifle even the cleanest of looks. For the brothers looking for a more ethnic feel, Afghan Chappals can easily be substituted. Remember: The more distinct your sandals, the less of a chance that they’ll be taken by a fellow brother or uncle! My personal favorites since my high school days. Loafers are an easy sockless option, dress up even the most casual of outfits and give a classy vibe without the stuffiness of laced options like brogues. Wear with Western ensembles for an office-appropriate look or with more traditional outfits for a polished, modern touch that adds structure to an otherwise draped outfit. Brothers who wish to add more flavor can go for embroidered or patterned varieties or substitute with Desi juttis/khussay or Moroccan babouches. Though it may be tempting to bust out the flashy high tops and chunky sneakers for looks that are more hip-hop or 90’s grunge-inspired, it’s best to keep things low-cut and pastel in warmer temperatures to ensure breathability. Chuck Taylors, Superstars, Vans and more are abundant and the cut and detailing that suits you can even be self-designed if needed! Summer style isn’t complete without a sweet pair of shades. Popular, classic styles include the Wayfarer, Clubmaster and Aviator shapes, with the first two being popularized by Ray-Ban since the 1950s. The key here is in choosing lens, frame colors and frame shapes that contour your face well, so be sure to google guides for buying the best sunglasses for your face shape or complexion. I’ve always found that a watch brings about a touch of uniqueness to any man’s outfit and that a man’s watch really does say a lot about his personality. Chunky bling or functional types are a no-go these days but just as well, a more minimalist or retro option blends better with a wide variety of outfits. Cheaper but well-made options can be found from companies like Casio and MVMT. Bracelets are an excellent way to bring a boho feel to your outfit and whether they’re used as statement pieces by themselves or with others, they’re an excellent way to show that you’ve put a tad more thought into your outfit than others. 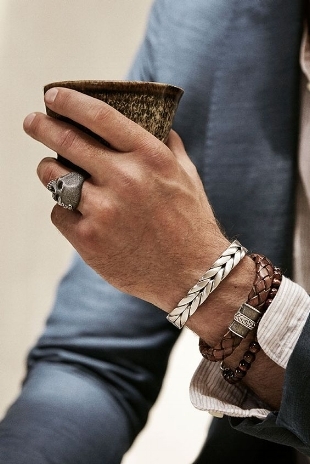 Options abound and range from chunky leather cuffs to minimalist bangles to well-strung rope. Perhaps one of the most forgotten of the sunnahs, rings come in various shades and sizes and will set you apart from the majority of the jamaat, as most men these days are rarely even seen with proper watches. Make sure that you get your proper ring size checked at the local jeweler to avoid a series of online shipping and returning conundrums. This is honestly one of my favourite looks of all time, masterfully executed by GQ Fashion Editor Mobolaji Dawodu. This is both classic and bold at the same time and the two keys that are keeping this outfit together are fit and the maintenance of a consistent color palette. This look would not look polished if his shalwar kameez were untailored or if his Panama hat and shades didn’t’ perfectly compliment his head and face shapes. Additionally, his choice of maintaining a look based on silver and mid-olive is truly a classy choice for summer amidst blinding shades of pinks, yellows and blues and additionally allows him to accessorise a bit with a watch and bangles. This is a great example of executing the Yemeni Izars I mentioned earlier. The print used here is of a more subtle pattern and color, in contrast to the usual casual Izars, which are typically printed in more bold colors and patterns. Also notice how he keeps the rest of his outfit simple and in similar shades so as to bring all attention to this beautiful izar. The most casual outfit featured here, this look blends streetwear and eastern draping influences which would be just as suitable for the mosque as it would for school or even the basketball court. I personally would alter this a bit and go for a longline tee with short sleeves to maintain more modesty and would also switch our the high tops for more subtle sneakers or sandals. This look is edgy defined. This man is obviously quite confident with himself and his heritage and excellently blends summer pieces amidst a subtle and intricate kimono pattern. While I don’t encourage smoking or the use of such hideous white high socks, I believe that this look demonstrates that with the right amount of confidence, even the boldest of looks can be worn well. Also notice how he keeps the color palette restricted to similar hues of blues and blacks for a more composed look, as disparate shades of colors with unique pieces would just make for an eyesore. A classic ensemble worn by Saudi designer Hatem al-Akeel, this look features a lightweight cotton thobe with a modest amount of tailoring which allows for more movement (a major issue with most thobes).The polished cognac loafers, clean grooming and swept back hair are ultimately what bring this look together. If even one of these elements were gone (such as if he had unkempt hair or dirty shoes), the look of elegance meant to be showcased by this particular thobe would be lost and the look would seem thoughtless. Another lesson to take from this outfit would be the employment of sandy colors which are perfect for both spring and summer ensembles. With that awesome list of essentials and outfits, this year’s summer Eid fashion guide for brothers comes to a close. We hope that you’ve gained some awesome outfit inspiration from this post and hope you all have a blessed Eid spent with friends and loved ones insha’Allah!